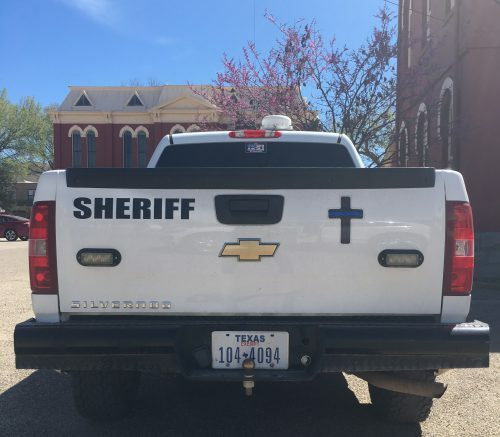 Brewster County has agreed to a settlement in the lawsuit filed by the Freedom From Religion Foundation (FFRF) against the county sheriff’s office over Sheriff Ronny Dodson allowing deputies to place Christian crosses on patrol cars. At a special meeting Tuesday, county commissioners agreed to a settlement offer put forward by the FFRF, a national activist group that promotes separate of church and state. The settlement brings the case to a close after an earlier vote by commissioners on March 22 to ban the sheriff’s office from allowing “political, religious, commercial or personal” messages or symbols on county-owned property – including patrol cars. The crosses began appearing on deputies’ patrol cars in late 2015. Austin-based lawyer Greg Hudson represented the sheriff’s office in the lawsuit. “When [the commissioners] made that action, it really pretty much rendered the lawsuit meaningless, so we settled,” he said. As part of the settlement, any cross decals on patrol cars will have to be removed within a week of the settlement terms taking effect, and the county will pay the FFRF’s attorney fees. The settlement terms also state the county isn’t admitting liability in the case, but that it will pay nominal damages of $1 to each plaintiff in the case – local residents and FFRF members Kevin Price and Jesse Castillo. The national group had brought the suit on their behalf. The attorney fees and the damages to the defendants will be paid by the Texas Association of Counties – the county’s insurance carrier. Hudson said he didn’t have much input on the decision to settle the case. “I think when this lawsuit came to light, the commissioners court looked at their policies and decided to address it on their own,” he said. Asked for a reaction to the outcome of the lawsuit, Sheriff Ronny Dodson referred questions to Hudson, his attorney. “It was just a business decision made that, rather than have a lawsuit continue on an issue that had gone away by virtue of the commissioner’s court action, we would save our fight for another day,” Hudson said. Before the settlement, the sheriff’s office had the backing of Governor Greg Abbott. According to the Houston Chronicle, Abbott asked Texas Attorney General in February to issue a legal opinion favorable to the sheriff’s office. “The U.S. Supreme Court has long recognized the demographic and historical reality that Americans ‘are a religious people whose institutions presuppose a Supreme Being,'” Abbott’s office wrote to Paxton, who has been asked to weigh in on the controversy playing out in sparsely-populated Brewster County. You can read more on the backstory behind the lawsuit over crosses on patrol cars in Brewster County here and here. This entry was posted in KRTS News and tagged Brewster County, Brewster County Sheriff's Office, Church and State, Freedom From Religion Foundation, Governor Greg Abbott, Law Enforcement, religion. Bookmark the permalink.